← Gero-Punk Contemplations: BOO (HOO)! Posted on November 3, 2012	by Jenny Sasser, Ph.D.
Several years ago I began hearing from some of my students and colleagues about this amazing woman named Velda. Again and again I was told that I absolutely must meet this Velda person because she was an “older than average” student who had come to Marylhurst to complete her undergraduate degree and perhaps continue on with graduate studies. The average age for Marylhurst students is somewhere in the middish 30s, so the older than average tease about why I should want to meet Velda didn’t seem terribly compelling—most of my students are older than average! 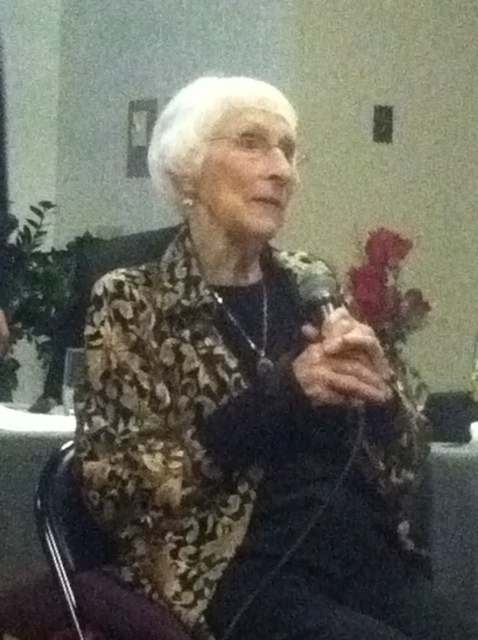 Though when I heard that she was in her mid-80s I must admit to thinking that it was quite wonderful that the age diversity at my university was so wide – Imagine the potential richness of a learning community that has students representing different life course phases, from just out of high school to extreme later life! All of this got me to thinking—Was the allure of Velda her advanced age, and was her advanced age alluring because she embodied some sort of anti-stereotype, and if so, what stereotype about being an old woman was she countering? She was taking on near archetypical status, and I was growing increasingly curious about who this person was whom had so many admirers, so many classmates and professors who seemed to genuinely love and admire her. Yeah, no doubt, it is pretty cool to grow old and keep learning but I kept wondering—is advanced chronological age a sufficient cause for becoming an elder “rock star”? I needed to see this Velda with my own eyes, I needed to be in her presence, hop onto her vibe, suss what was what. So I started asking those at the university who interacted with Velda the most to extend an invitation to her letting her know that she could feel free, if she wanted to, to stop by my office to say hello. By then I had heard a bit more about her, that she had lived a really interesting life in the U.S. and abroad, practiced the Baha’i faith, had a large and close family and social network, remarried in later life, and had some pretty big aspirations for her next-self. I also heard from her advisor that she was writing her undergraduate senior paper on a “good old age,” laying the groundwork for what she hoped would be a future Master’s Thesis and, perhaps, a published (and wildly successful) book. I became even more compelled to figure out how we could bump into each other, explore some ideas together, see if I could be of any support to her as she worked on her long-term scholarly (and, it turns out, deeply personal) project. And then, and then, guess what happened? Velda showed up in my spring term 2010 Women’s Issues in Aging seminar! Tiny, white haired, sparkly-eyed, and very genteel, Velda quickly became the heart of our learning community, our touchstone, because she’d lived so much life and had been through so much and – and this is crucial – had reflected upon her experiences, good and bad and everything in between. Velda’s curiosity and commitment as a learner and generosity as a member of our learning community knew no bounds. She brought an open heart and mind to every class session, she took responsibility for her own learning and also communicated to me and her classmates about what she wanted to contribute, and what she needed from the rest of us in order to do her best work. (Velda could also be a rascal – When her ire got piqued, her equanimity might suddenly transform before our eyes into a kind of fierceness. She had the inner authority that comes from life experience, and she was willing to speak what she felt was the truth even if potentially transgressive.). The work she and her classmates and I did together in that seminar is some of the most embodied, holistic, and meaningful learning of my life. After the term was over, I offered to be a sounding board for her as she worked on her undergraduate thesis. Velda accepted my offer, though she made it clear that she knew some stuff about aging and being old that the rest of us – me, the gerontologist, included—didn’t know, couldn’t know, until we, too, were old. She was suspicious – and continued to be for a long time, perhaps still is – about whether Gerontology had anything to offer her as a scholar inquiring after what constitutes a good old age, because, and she’s right, Gerontology is a field populated by mostly younger and middle aged adults who make aging, old age, and old persons the focus of their inquiry and practice. I told her that Gerontology may not have much to offer her as a scholar, though I thought it might, but I knew for certain that she had much to offer Gerontology, and that if she wanted to do scholarly work on aging and old age, she couldn’t completely ignore the academic discipline and field of study and practice that was devoted to the human aging journey. We agreed to meet in the middle. This term, Fall 2012, I again have the wonderful pleasure of working with Velda in the context of the Embodiment in Later Life seminar, a collaborative inquiry course in which we explore through reading and discussing various kinds of theoretical and empirical work, and engaging in critical self-reflection, experiential learning practices, and hybrid forms of writing what it means to travel through the life course, especially the later part of the life course, with/in a particular body. Now in the second year of the Master of Arts in Interdisciplinary Studies program, Velda’s looking toward her thesis project, which will expand the work she began as an undergraduate student. In between the third and fourth weeks of our course, just when things were starting to get really juicy, Velda fell in a parking lot after doing grocery shopping, fracturing her hip and wrist. She had to be hospitalized, have surgery, and then rehabilitate at a nursing home for a couple of weeks. Her classmates happily agreed to move our weekly sessions to wherever Velda was—at the rehab center these past two weeks, and at her home most probably for the rest of the term. Talk about embodied learning in context! Talk about the confluence between the personal and the scholarly! There’s so much, so much we’re exploring together because of what has happened to Velda, but more to the point, because of the curiosity and grace with which Velda faces even the most extreme circumstances, and because she invites us into her life so fully that we get to accompany her on her journey, even when it isn’t terribly smooth. You just can’t be near Velda without learning something essential about what it means to be a human being traveling through the life course on this particular planet, about what it looks like to engage in one’s unfolding as a human through thick and thin, for the long haul, ever hopeful, always dreaming. Yesterday, Velda was discharged from the rehabilitation center. Perfect timing, as today is her 90th birthday and she’s having a huge party. Jenny – you have given us a rich perspective of “the Velda we know and love.” Velda inspires me. Believe me, I am taking notes. I had the honor and pleasure of serving on the board of the Amercian Women’s Club in Denmark with Velda 10 years ago. I am not surprised to hear of what a remarkable person she still is! What a beautiful woman!